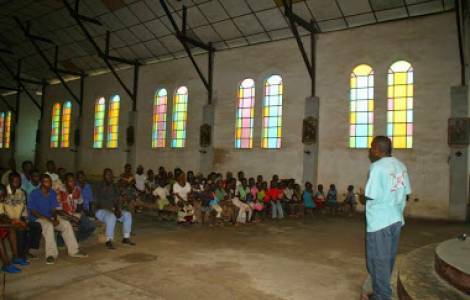 Kampala (Agenzia Fides) - "The role of catechists in Uganda has always been and remains a determinative force in the work of evangelization. Without your generous dedication, surely the growth of the Church would be much diminished in this country. Thank you for all your work, for the sacrifice of yourselves and of your families, and for your devotion that people may know Jesus Christ". This is what Cardinal Fernando Filoni, Prefect of the Congregation for the Evangelization of Peoples, said to the Catechists and teachers of the Archdiocese of Kampala, gathered at Munyonyo Uganda Martyrs’ Shrine (see Fides 26/10/2017). The Prefect pointed out that the Archdiocesan Golden Jubilee is a call for a "beginning of a new era of the Catholic Church in Kampala", a Church according to the mind of Christ her founder, "a Church capable of effectively addressing at least some of the major challenges facing most of the people and societies on the African continent". By inviting to renew the commitment to deeper evangelization, starting with fresh enthusiasm, the Prefect recalled the main features of the catechist's mission: "proclaiming Christ's message, participating in efforts to build community life, leading people in prayer and worship, motivating others to serve their neighbors, instruction and formation of conscience, etc... also the service of charity is a constituent element of your vocation and mission". Cardinal Filoni then emphasized the importance of coherence and authenticity of life, as for many communities as well as for individuals "catechists are the immediate and firsthand models of Christian life". "To them, your way of life speaks louder than what you say during your Sunday services. For that reason, before you preach the Word, you must make it your own and live by it. Before doing the catechesis, you must first of all be a catechist". The authenticity of Christian life must first of all be seen and expressed in one’s personal relation with God, that is, in the life of prayer, meditation of Sacred Scripture. Married catechists are expected to bear witness constantly to the Christian value of matrimony. "One is a catechist because he/she has been called to evangelize; to make Christ known, loved and followed by those who do not yet know Him and by the faithful themselves - continued the Cardinal -. According to our Lord’s missionary mandate, the Gospel has to be proclaimed to all people, men and women of all places and ages. So far, this mission in our times is still very far from what our Lord desires. This is also true with regard to this country; there are still many people in Uganda that need to hear the Good News. The permanent awareness of your call to evangelize should be a source of missionary and apostolic zeal. Missionary zeal is the great enthusiasm we have for proclaiming the Gospel; a burning desire to share the Good News of Jesus Christ with others".